January has been jam-packed so far. 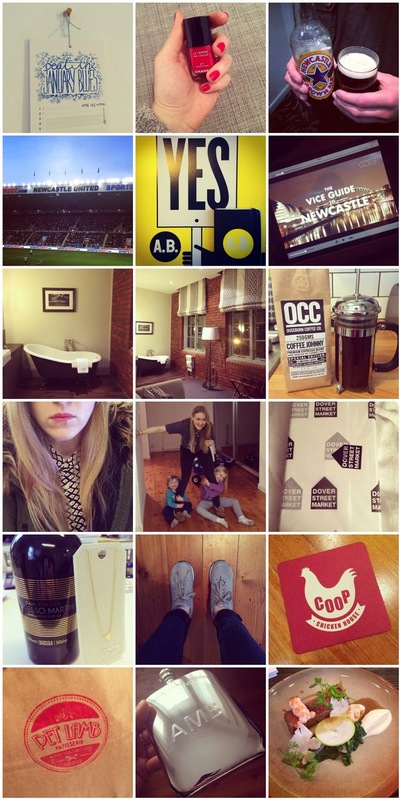 From a night in Hotel du Vin, to trying out some of Newcastle’s new food joints to my birthday, it’s been a brilliant beginning to 2014. Here’s some of the best bits so far. 1. Cotton Post calendar to keep 2014 in check / 2. Chanel Le Vernis Rouge Rubis – a gorgeous Christmas present / 3. Joe representin’ at the match / 4. We lost the battle / 5. Obsessed with all things black, white and yellow at the moment / 6. Seeing my pals in action in Vice Canada’s Guides to Newcastle / 7 & 8. A night in the unreal Hotel du Vin in Newcastle. Look at that room! Brilliant food, exceptional cocktails and a little bit of a sore head the following day. All signs of a brilliant Friday night. / 9. Favourite blend from OCC / 10. Going button-up in Celia Birtwell for Uniqlo / 11. Hangin’ with my two of my favourites; Oliver and Bella / 12. Happy birthday to me! Treats from Dover Street Market (underneath the wrapping was an unreal CDG wallet which has been on my wishlist for some time / 13. Gifts from my gorgeous team at work – my favourite espresso martini and a delicate gold necklace / 14. New kicks. / 15. Checking out Coop in Newcastle – just one of the many new food joints which seem to have popped up over night / 16. Perfect patisserie from the Pet Lamb girls / 17. An unreal birthday present; personalised hip-flask *inserts heart-eyed emoji* / 18. Unreal bait at North Shields Fish Quay’s latest establishment, The Staith House (on the plate is slow cooked pork belly with langoustines, spinach and cauliflower puree).